Low Temperature Tecnoclima Series Air Heaters. 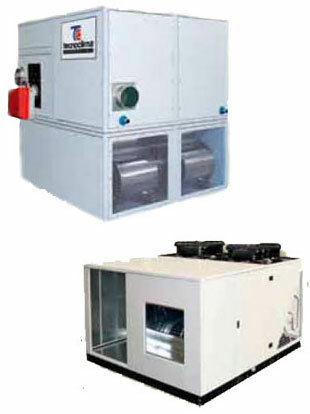 Indirect and direct fired air heaters for heating and drying applications. The heaters are supplied in horizontal and vertical configurations to suit a wide range of applications. Thermal efficiencies from 90% -+ 108% (including condensing designs). -20°C to 45°C differential temperature rise (higher temperature designs available). 250Pa to 450Pa discharge air pressure (high delivery air pressures available). 18.5kW to 1160kW thermal output range. Gas and Oil fuel fired options. Absence of refractory shielding walls. Monobloc configuration with burner, control panel instrumentation and safety devices fitted and wired as a package unit. The air heater is ready for site installation and connection to services and ducting if required. The air circuit can be configured positive pressure or negative pressure applications. Proprietary burners are fitted to enable local spare parls and service availability. Exhaust emissions comply with all Australian requirements. Heaters are fully tested at the manufacturing plant prior to shipment. Compliant with all Australian and International Standards. High & Medium Temperature Series. 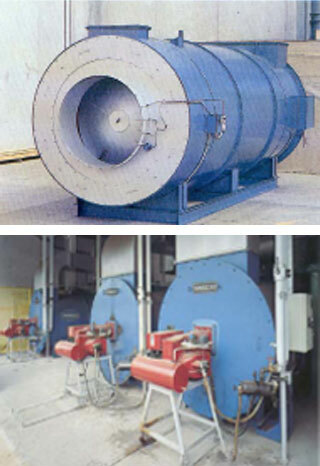 Indirect fired air heaters for drying applications using clean atmospheric air. The heaters are cylindrical and horizontal in configuration, incorporating a stainless steel combustion chamber. Monobloc configuration with burner, control panel, instrumentation and safety devices mounted and wired as a packaged unit. The air heater is ready for site installation and connection to service and ducting. The air circuit can be configured as positive pressure or negative pressure delivery. Integral and proprietary burners of many types and conf,rguration can be utilised with is design of heater. Exhaust emissions comply with all Australasian requirements. Thermal capacities of 175kW – 2326kW for the HTW & MTV series ofheaters. Maximum air outlet temperatures of 300°C for the HTV series 230°C maximum Δ T for the HTV series and 130°C maximum Δ T for the MTV series. Air circuit pressure loss 90 mm WC for the HTV series and 45mm WC for the MTV series.